Florrie Forde and Betty Balfour on the set of 'My Old Dutch', 1934. 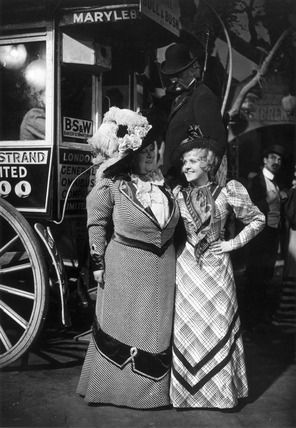 Australian-born singer and entertainer Florrie Forde was a star of early 20th century music hall, and British actor Betty Balfour became famous on the silent screen. They starred together in 'My Old Dutch', a Gainsborough film. Clement Attlee, Labour politician, 19 April 1945. Two women enjoying a cold drink, 1938. Butlins holiday camp, 8 July 1939. 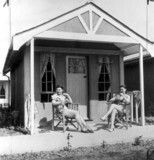 Two women walking past chalets at a Butlins holiday camp, 8 July 1939. WW2 utility clothing for women, c 1942.